She tweets, she blogs, she scores. Of all the avowed jazz fans out there, a one Donna Mercer clearly leads the pack in Twitter followers. 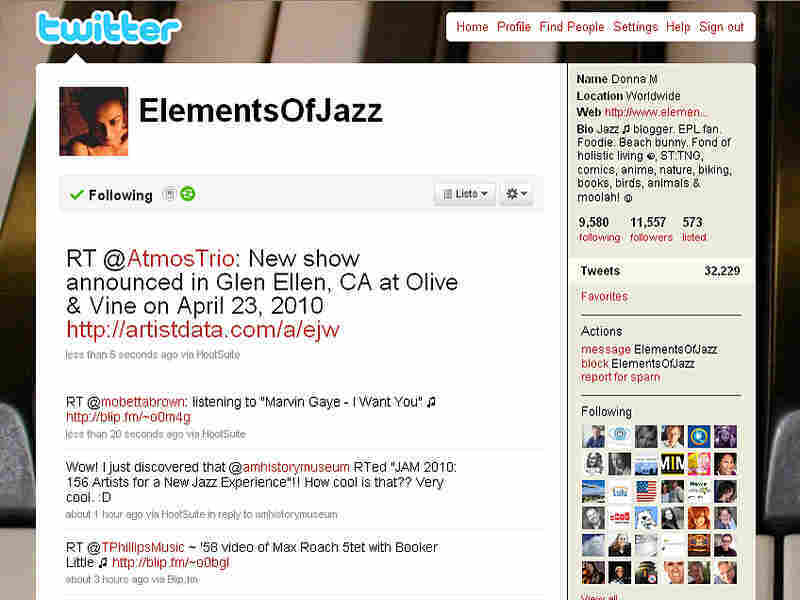 As @ElementsOfJazz, over 11,500 accounts (and growing) follow her every notice, shared file and announcement. And she sent out a lot of notices, files and announcements. As of Monday, she's also a jazz blogger. Elements Of Jazz stems from her "desire to bring appreciation, understanding and camaraderie to the world of jazz artists & their fans," she writes. With the site, she joins the slim but growing ranks of jazz bloggers who happen to be female: the last few months have also seen the emergence of Maryam Balbed's DC Jazz Shows and Jenn Hardy's Pork Pie Jazz. Could you describe to me what you do with your Twitter account? What's your intent, your goal? I talk to people about music and life. That's basically what I do. My intent is to introduce jazz in all of its wondrous guises to people -- one or two people at a time! My goal is to compel people to listen and to realize that you don't need a scholar's knowledge to enjoy jazz. Ultimately, I want to encourage people to buy CDs, download tracks and go see LIVE jazz! Why @ElementsofJazz as a handle (and now a blog title)? I use "Elements of Jazz" as my profile name because it's the domain name that I have registered. Also, I picked the word "elements" to convey the idea that there are many components to jazz. It is my intention to present various elements of jazz when the Web site is live. Do you or did you ever play jazz? No, I am not a musician. A few years ago a dear friend passed away suddenly. The death and subsequent gap that was left in my life became overwhelming. "How can I deal with this grief?" I continually asked myself. My friend loved jazz while he was alive and tried valiantly to get me into it. I would listen but not really hear. I was like, "Yeah, yeah, whatever..."
I immersed myself into jazz to transmute the grief -- it was a connection to him. It soon became a passion. How did you discover Twitter? What do you like so much about it? Back in 2007, I noticed that some of my acquaintances on MySpace weren't logged in as much. "Where is everybody?" I would ask. A lot were starting to migrate to Facebook. That platform didn't appeal to me at the time. A couple of my close friends went to Twitter. Because of those folks and Problogger.net's Darren Rowse, I finally checked out Twitter in May 2008. I like the immediacy of Twitter. I refer to it as "ordered chaos." Whether it's news about natural catastrophic events, political upheavals, or the newest CD release, it's the "go to" community to find out the latest in a timely manner. You're frequently up until the wee hours of the morning Tweeting ... why the late hours? What allows you to stay up that late? I've always been a night owl. That is why I tweet until the wee hours of the morning. Plus, I realized a while ago that I can connect with people in Europe who are starting their day if I'm on until 6 a.m. (U.S. EST). I also get to chat with people in the Near and Far East that are just ending their day. It works well. How many of the folks that you Tweet with have you ever met, or seen in performance, or even talked to on the phone? I estimate that I've met close to a few dozen Twitter people so far. I've seen about a dozen in performance. It's also approximately a few dozen that I talk to via the phone. I'll be living on the East Coast again at some point this year so the numbers should increase dramatically. I'm excited about that. On Twitter, you are unerringly positive -- or at least empathetic. You say good night when you sign off. You even thank people who RT you. You're completely sincere. Is there anything about jazz which annoys you? The perpetuation of the idea that jazz is dead. It's not an annoyance but it doesn't serve the greater good. Donna Mercer on her @ElementsOfJazz Twitter account, and on her blog.